Let’s be honest: a lot of “kids” board games are awful. If you have ever spent an hour trying to climb to 100, only to slide all the way back down to 4, you know what I mean. Yet so many board games are incredibly fun and rewarding. How do you get your kids interested in more serious board games, and what are some good games to start with? First, my bona fides: I’m the father of three kids ages 8 to 12 who have loved board and card games since they were young. This summer, we’ve played Ticket to Ride, Agricola, Red 7, The Great Dalmuti, Guillotine, Settlers of Catan, Small World, and Munchkin. Last week, my wife and I taught the older two how to play euchre. For the past few months, we’ve been members of gamejoule, a startup company that rents you a box full of games for a monthly fee. Our subscription has enabled us to play Castle Panic, Boss Monster, King of Tokyo, Loot, and many more fun games, without having to buy them. 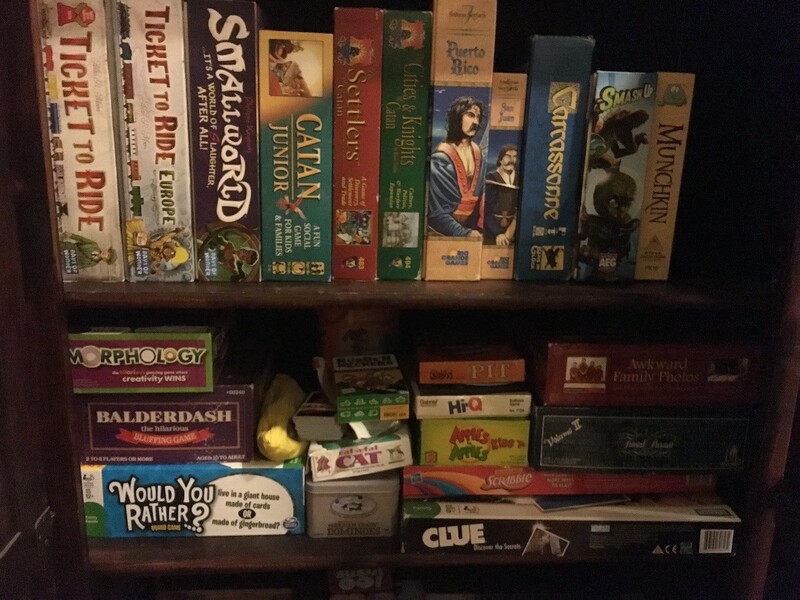 My wife and I have loved games ever since we were dating, and we wanted to pass on our hobby on to our kids. It hasn’t always been easy. There were many hours of “playing” child-friendly spin-the-arrow-move-like-a-robot games before our kids were old enough to enjoy more interesting games. Looking back at our journey, here’s what worked. Keep it fun. The number one rule: games are supposed to be fun! My wife inherited a strong competitive streak from her grandmother (who used to dominate at Rook). Meanwhile, I have a low tolerance for disorder. Because we’re aware of these tendencies, we’ve (usually) been able to keep the games light and playful. Sometimes, this might mean “forgetting” to keep score or playing an easier version of a game while the kids are catching on. If a game is stressful and anxiety-producing, kids won’t come back. Try new games. We live in a golden age of games. Whatever kind of game you prefer, you can probably find dozens of high quality, well-designed games in that genre. Often, kids don’t want to play a game because it’s gotten boring or because one member of the family is a lot better than everyone else. Keep introducing your kids to new games so they get used to the idea of different rules and different styles of play. Let the kids pick. Kids will start to choose favorites, and they may not always be the games that you would pick. Be willing to play/endure games that your kids love, so that they will learn to put up with your crazy games. You’ll model good behavior for them and develop a sense of what they like about games. Cultivate a collection of well-designed games. One of the best ways to get your kids to play better games is to have better games around the house. It’s a bit like getting your kids to choose healthier snacks: if you have healthy snacks as the only option, that’s what your kids will pick. Dominoes, Checkers, and Backgammon: While chess gets most of the attention, these three can make great games for kids, too. Their rules are simple, inexpensive sets can be found almost everywhere, and they lend themselves to cross-generational gaming. You can also use them for a variety of games of different skill levels, and, unlike cards, most sets are durable enough to stand up to rough play. Max: A great cooperative game that features simple mechanics and high stakes (well, for kids). Max is a housecat, and you have to help a bird, mouse, and chipmunk get home before Max catches them. When each player rolls the dice, sometimes you get to move the woodland creatures, but sometimes you have to move Max. Treats like milk and catnip will lure Max back to his starting place, but you have a limited supply. As a cooperative game, all players win or lose together. Family Pastimes Cooperative Games. Ages 4 to 7. 1 to 8 players. Buy from Amazon. Rat-a-Tat Cat: In this card game, each player has four facedown cards numbered 1 through 9, but she knows the value of only two of them. Your goal is to have the lowest score at the end of the game. As you pull from the draw pile, you can try to replace your cards with lower numbered cards. The game ends when a player thinks he has the lowest score — but he might be handing the game to his opponent instead. This game teaches kids to observe their opponents’ actions and keep track of their progress mentally. Gamewright. Ages 6 and up. 2 to 6 players. Buy from Amazon Note: Gamewright makes a huge number of fun family card games. I have not found a bad one yet. Ticket to Ride: A classic! Build train lines across the United States (or Europe, Africa, Asia, and other locations) to connect cities and score points. my kids were immediately drawn to the game by the fun game pieces and colorful cards. When our kids were younger, we made the game easier by omitting the Destination Cards, which require you to connect specific cities. That way, our kids could learn the basic gameplay with a bit less strategic thinking required. Days of Wonder. Ages 8 and up. 2 to 5 players. Buy from Amazon. Forbidden Island: Another cooperative game, Forbidden Island places the players on a sinking island filled with treasures. Collect all four treasures before the island sinks, and everyone wins! This game throws in some wrinkles that make repeat play enjoyable, such as a variable game board made of tiles, abilities forneach player that vary from game to game, and the option to increase the difficulty level as you increase your skills. Gamewright. Ages 10 and up. 2 to 4 players. Buy from Amazon. Castle Panic: Like Forbidden Island, this cooperative game requires teamwork and strategic thinking. Your team is defending your castle from attacking hordes of orcs, goblins, amd trolls. Each turn, more appear, and the monsters already on the board get a little closer. You have to work together to fight them off with a combination of soldiers and special ability cards. The hordes have some special abilities of their own, which adds unexpected challenges to the game. Fireside Games. Ages 10 and up. 1 to 6 players. Buy from Amazon. Why So Many Cooperative Games? Traditional games have a winner and a loser. For some kids, this can be a pretty tough lesson to absorb, especially if you’re playing a difficult game that you are still learning. Healthy competition is an important part of personal development. Learning to lose with dignity and win with grace will serve children well for years to come. Nonetheless, competition can have a dark side. They create an environment where parents, kids, and siblings are all working together. They help temper the overcompetitiveness of some kids (and parents). Younger kids can be introduced to the game while still not quite old enough to understand the rules, because their teammates will help them figure it out. For our family, board games create an environment where we play and compete together. I’m convinced there are long-term benefits of playing board games, such as challenging yourself mentally, interacting with others on multiple levels, and learning how to deal with disappointment. Our main reason for playing board games, though, is that it’s fun. Even better, it’s a kind of fun that we can continue to enjoy for years to come. Earlier, I mentioned my wife’s grandmother, whose moral beliefs forbid from keeping a deck of standard playing cards in the house but loved Rook with a passion. Well into her eighties, she would love to school her children and grandchildren on the finer points of her favorite game. I hope that I’ll have this same kind of relationship with my kids. Decades from now, maybe my kids and grandkids will gather around the holo-fireplace to play Ticket to Ride: Olympus Mons. At that point, they’ll be the ones teaching me new games as I get confused about the rules, but we’ll still be having fun.